Since 1976 scientists at Vostok Station have been working on solving the question of whether living material exists in Lake Vostok. The first ice cores for biological (actually microbiological) analyses were taken at Vostok Station by Dr. Abizov from the Institute of Microbiology of the Russian Academy of Sciences, who retrieved the first ice cores. A portable Microbiological Drilling Unit and a laboratory for sterile sampling and analyses of ice cores was constructed. A small structure (9 m x 3.7 m and 2.5 m high) was installed on a sled and situated 400m away from the station to the west (in the direction opposite to the main wind direction). 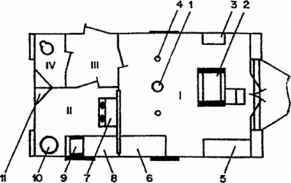 The microbiological house was equipped with an electro-thermal (later mechanical) drill. Some procedures were taken to sterilize the drill and its components prior to the beginning of drilling (Figure 7.7). The core drilling for microbiology was only conducted from within this structure. The samples from the core were extracted and their inner parts were removed using a special device constructed for this purpose (Figure 7.8). Figure 7.7. The housing for the microbiological deep-core drilling at Vostok Station (adapted from Abizov, 2001): I - drilling section, II - microbiological section, III - entry, IV - washing space, 1 - the mouth of the borehole, 2 - the winch, 3 - drilling control, 4 - foundations of the drilling rig, 5 - table, 6 - storage box for sterile extraction of ice core samples, 7 - box for sterile ice sample analyses, 8 - working table, 9 - thermostat, 10 - hot steam pot, and 11 -water tank. Figure 7.8. A device for sterile extraction of ice samples from the ice core station (adapted from Abizov, 2001): 1 - ice core, 2 - heater, 3 - sterile meltwater pipe, 4 - water collection cup, 5 - support for heating element, 6 - ring of breaking device, 7 - ice core support, and 8 - sterile bottle. morphological diversity. Prokaryotic micro-organisms (bacteria of various shapes and sizes) were found throughout the whole length of the core. Figure 7.9 shows these features in ancient ice cores located at depths from 1,500 to 2,500 m (Abizov et al, 1998b). Dr. Abizov showed by using the results of inoculating the samples into nutrient media, that the microflora of these horizons chiefly consisted of spore forming bacteria (Abizov, 1993). It is possible that the vegetative cells of spore forming bacteria, which represent the majority of grain-positive bacteria, are especially cold resistant and capable of long-term anabiosis with their vital functions being retained (Abizov, 1993). The microbial cell numbers in different horizons ranged between 0.8 x 10~3 and 10.8 x 10~3 in 1m3 of ice. 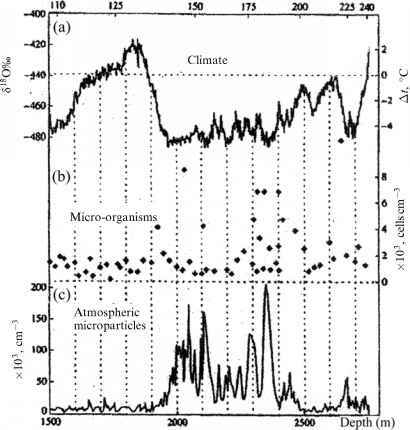 Figure 7.10 (Abizov, 1998b) shows the quantitative distribution of microorganisms and dust particles in ice samples from different depths, corresponding to different ages of ice. It seems that there is no definite law underlying the quantitative distribution of these organisms with respect to depth. However, glaciological studies of dust particle distribution along the ice core length show that the fluctuation of dust concentration depends on the fluctuation of climatic conditions (Jouzel et al., 1993). Figure 7.10. Distribution of numbers of micro-organisms and dust particles along the length (age) of the Vostok Station ice core (adapted from Abizov et al., 1998b). (a) Climate change, (b) concentration of microbial cells along the core, and (c) concentration of dust particles along the core. exist in anabiosis for this period of time in Antarctic ice with their vital functions retained. However, the number of viable cells decreases with increasing depth (and age) and does not correlate with the total number of intact cells at the same horizons (Figure 7.11). The discovery of accreted ice at the bottom of the ice sheet opened the way for a microbiological study of Lake Vostok water through ice core studies (Priscu et al., 1999; Karl et al., 1999; Abizov et al., 2001; Bulat et al., 2001) because there are 130m of the ice sheet remaining between the bottom of the borehole and the ice/lake water interface. However, the danger of contamination of the lake is a major issue preventing further drilling. Figure 7.11. Percentage of vital micro-organisms of different types decreasing with depth (and age) of the ice core (adapted from Abizov, 2001): 1 - non-spore forming bacteria, 2 - spore forming bacteria, 3 - yeasts, 4 - mycelium mushrooms, and 5 - a change of the total number of vital micro-organisms. inclusions is thought to have been accreted over turbulent lake water (Wuest and Carmack, 2000). The isotope and gas content data (Souchez et al., 2000; Lipenkov and Istomin, 2001) suggest that formation of this upper section of the lake ice was accompanied by trapping and subsequent freezing of liquid water inclusions (so-called "water pockets"). On the other hand, the extremely low and uniform gas content of the ice, and the absence of mineral inclusions in the lower section of the accreted ice stratum (from 3,609-3,623 m and likely down to the ice-water interface) rule out significant involvement of liquid water pocket formation in the freezing process. This deepest ^140-m section of the Vostok ice has likely been accreted at the maximum water depth where the convection of lake water was very low (Wuest and Carmack, 2000). Consistent with this, both the gas content and the concentrations of major ions are found to be a few orders of magnitude higher in the upper layer of the accreted ice than in the lower layer. It was mentioned previously that the preliminary study of this accreted ice from different horizons shows the existence of different micro-organisms in the core. The number and diversity of these micro-organisms is different for each of the different horizons and correlates with organic and inorganic inclusions in the ice samples, but there is no distinct evidence that the number and types of organisms in accreted ice differ dramatically from ice of glacial origin. Figure 7.12. Bacterial cells in accreted ice taken from a lower part of the Vostok Station borehole (adapted from Priscu et al., 1999). Cells (marked by arrows) under scanning electron microscope (A-E) and atomic force (F) magnification. 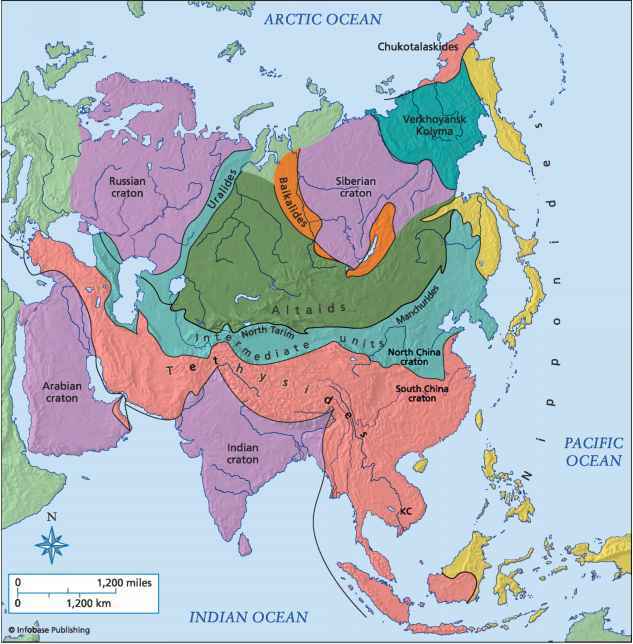 of ice (Montagnat et al., 2001). As a result, the use of accreted ice composition to predict lake water composition has to be viewed with caution. However, models predict that active microbial assemblages should be able to exist in veins and interstices between ice grains. A number of microbes have been detected in accreted ice, and data reveal that bacterial diversity is low with the DNA detected being typical of modern DNA (Priscu et al., 1999; Karl et al., 1999). 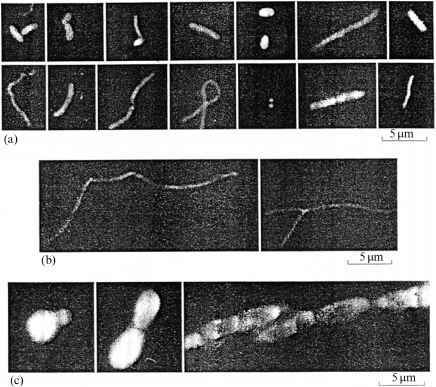 Figure 7.12 shows (arrows) bacterial cells identified by Priscu et al. 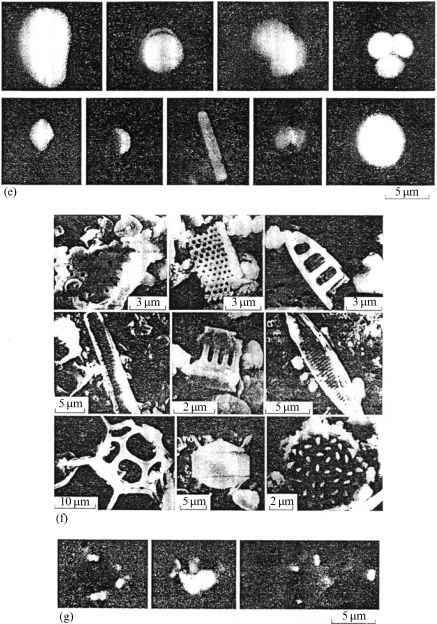 (1999) using a scanning electron microscope (Figure 7.12 (A-E)) and an atomic force microscope (Figure 7.12(F)). 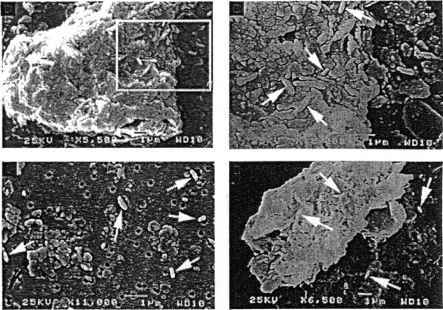 However, molecular biological studies of this ice (Bulat et al., 2001) suggest that there are few if any microbes in the accreted ice, and most microbes detected until now may be related to contamination of the drilling fluid and core handling. Some new data acquired by "ultraclean" technology shows that bacterial densities in previous reports were overestimated by perhaps an order of magnitude. It was also shown that a number of viruses exist in glacial and accretion ice and these viruses show a variety of unusual morphologies. The origin of these viral particles is unknown, but DNA studies to identify it are underway. Siegert et al. (2003) believe that microbes associated with accreted ice migrated through the ice and entered the surface waters of Lake Vostok in meltwater being quickly incorporated in the accretion process before the meltwater mixed with deeper lake water. Some molecular biology studies identified a strain of bacteria whose DNA is similar to hemophilic bacteria (Bulat et al., 2001), suggesting the possibility of hydrothermal activity in Lake Vostok. If proved, it will provide new ideas on what to expect in the waters of Lake Vostok (Bulat et al., 2004).